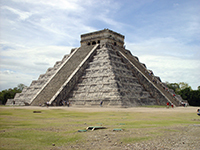 Mexico is home to one of the wonders of the world, Chichen Itza, while the Historic Centre of Mexico City is another renowned attraction. The Chapultepec park and Riviera Maya, meanwhile, display the beauty of Mexico. 363,142 British nationals visited Mexico in 2012, which can be accessed only by airplane given its 5,225-mile distance from the United Kingdom. Flying from Birmingham to Mexico City, the capital of Mexico, takes around 15 hours on average. Regardless of where you are visiting in Mexico, you should expect to be in the air a long time and to be medicating on board the plane. Mexico uses three different time zones, so it is wise to assess the time difference of your destination before landing to assess your medication plan. Certain areas of Mexico tend to have different climates, but generally Mexico is a very warm country with exceptionally hot summers. Travellers with diabetes visiting Mexico should carefully research what temperatures to expect during their stay. People who treat their diabetes with insulin should regularly check their blood sugar levels as insulin absorption can be enhanced in warmer temperatures. You could consider reducing your dosages if you are planning periods of physical activity and are worried about hypoglycemia. The currency in Mexico is the Mexican Peso. Money can be exchanged once in Mexico, but you are more likely to secure rates if you collect your currency prior to arrival. There are no mandatory vaccinations to enter Mexico, however some are recommended. You should consult your doctor eight weeks prior to your departure in order to receive the vaccinations in time. Some travellers are also recommended to receive vaccinations for other diseases, including hepatitis B and rabies, which can be carried by dogs, bats and other mammals in Mexico. UK citizens with diabetes will not be entitled to any free medication services while in Mexico. Securing comprehensive medical insurance will be essential in order to obtain even basic treatment. Diabetic medication is available in Mexico, but payment will be required from all pharmacies. Blood and urine testing kits are available from pharmacies in Mexico. The emergency services telephone number to be called in Mexico is 065. It is worth checking with the manufacturer of your meter in the UK if the particular equipment you require is available in Mexico beforehand and if it is sold under any different names. You should note which syringes are available in Mexico, with U-100 syringes the most commonly used. What language is spoken in Mexico? Spanish. Locals will have a grasp of English, but it will pay to learn some basic Spanish phrases to assist in your day-to-day activities.